The Crown Library's article databases are the best places to find reliable articles on any subject for your research and assignments. The videos on this page provide general information on finding and using databases and articles. For help using a specific database, check out our tutorials guide or ask a librarian! This video will show you how to find databases at the Rebecca Crown Library. You can find databases by title, subject, or content type. This handout shows you how to access databases from the Rebecca Crown Library. This video shows you how to find and search from articles and other resources from Academic Search Complete through the Rebecca Crown Library. The accompanying handout provides printable instructions. This handout will show you how to find articles in the database Academic Search Complete. 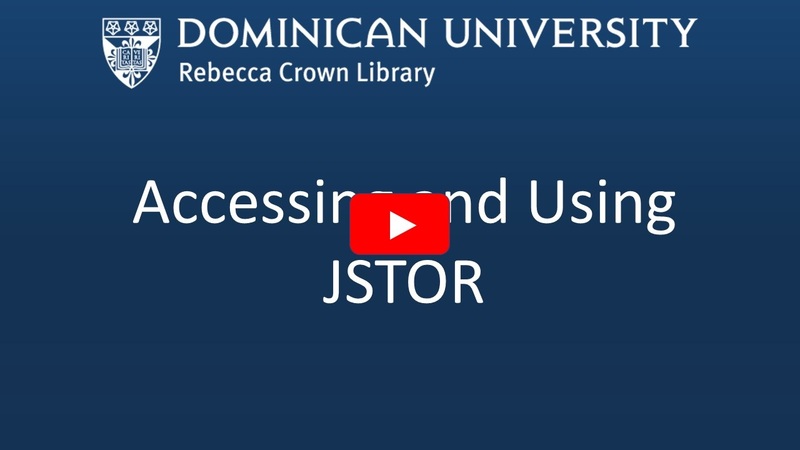 This video will show you how to access JSTOR through the Rebecca Crown Library, and how to search the database. The accompanying handout provides printable instructions. This handout shows how to perform an advanced search in JSTOR. In this video you will learn how to access full text articles not available in the library databases through Interlibrary Loan. The accompanying handout provides printable instructions. This is a printable handout waking your through the steps to get a full-text article form another library through interlibrary loan. Crown library databases are available to all enrolled students. You can locate the databases from the library homepage under the "Articles & Databases" tab. When using databases off campus, you will need your network ID and password. Your network ID is the first part of your Dominican email address and your password is the same password you use for email.